Mike Golding made an official announcement this morning about his new Owen Clarke Open 60 and the continuing sponsorship by Ecover. 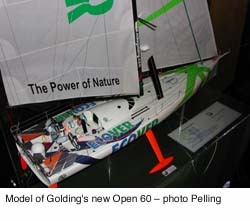 Golding, who’s already stacked up a long list of sailing successes including a seventh in the 2000-01 Vendee Globe and finishing a close second overall to Ellen MacArthur in the 2002 Route du Rhumb, will compete in the 2004 Vendee Globe and complete what he believes is ‘unfinished business’. While these aesthetic changes will undoubtedly make the boat more ‘comfortable’ to sail, it will be interesting to see what difference the new hull shape, rig and the culmination of fine tweaks has on speed, particularly upwind, and whether she’ll be able to break the current Finot design’s 31-knot top speed.